Are you losing customers in your sales funnel? Getting prospects into your sales funnel is good. But you shouldn’t stop there because there is another step—you’ve got to keep the prospects in your sales funnel. You can’t afford to keep losing customers in your sales funnel after investing time, money, and other resources on inbound marketing and paid advertising to generate customers. If that’s the case, then your business is probably suffering. However, you can’t expect to retain every prospective customer in your sales funnel. According to Gleanster, only 50% of marketing leads enter a sales funnel not ready to buy while only 25% are prepared to buy. However, you have to make efforts to retain the 25% of prospects who are ready to buy — thus, increasing your retention rate is critical if you must trounce the competition. If you lose customers in your sales funnel, guess where they will go? Your guess is as good as mine — they will switch to your competitors. With that being said, here’s how you can stop your leads from leaking out of your sales funnel. The first step to solving a problem is to identify it. You should find out exactly what’s causing your prospects to leave your sales funnel. Is it because your sales funnel is too long? Are there some support or information they need that you’re missing? Can you make the process seamless for them? Well, the guys at Google are smart marketers. They knew you’d need to track your sales funnel. So they created the “Goal” feature in Google Analytics. With this feature, you can set the goals you intend to achieve at all levels of your funnel. You’ll also be able to monitor them to know when customers are not meeting the goal and exactly where they are dropping off. There might be many reasons that could be stopping your prospects from converting—identifying the exact issue will make it easier for you to fix. However, here are some things you could do at each stage of the sales funnel to increase your chances of converting more prospects to customers. When your marketing targets the wrong audience, you get the wrong traffic to your landing pages which will result in having low-quality leads or leads that aren’t ready to become paying customers. If your prospects are leaving your sales funnel towards the top of the sales funnel, it should ring a bell—most of them might not the right customers for your business. You should have copy that leads them to your landing page — the article, email, etc. Make sure they target and attract people who are interested in your product and your goal should be clearly communicated. Generating sales leads that are not ready to convert to your sales department will be a complete waste of time and money. A recent study shows that 40% of an e-commerce store’s revenue is created by 8% of its customers. It’s not about accumulating plenty of leads; it’s about attracting customers that are extremely interested in your product, and are ready to buy. So what should you do to ensure you’re attracting the right customer? Evaluate your content and be sure it’s going to reach exactly who you’d want it to. Are the keywords you’re targeting attracting the customers you need at a particular stage of your sales funnel? What about your distribution channel? Ensure that you are actually marketing to customers who are in need of your product. If you’ve generated leads and you are not making use of a CRM (Customer Relation Management) to follow up and nurture your them, you’re making a big mistake. Marketers record a 20% increase in sales from nurtured leads compared to leads that are not nurtured. 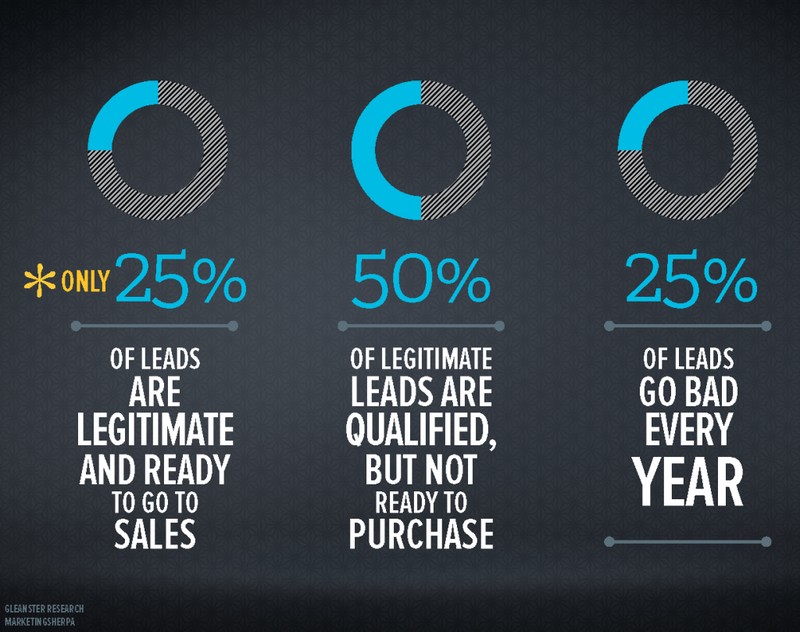 Another study by MarketingSherpa found that 79% of leads never convert to sales opportunities. Yes, generating leads is important but managing your leads — qualifying them and converting them to premium customers, is even more profitable for your business. By using the data from your CRM, you will know the leads that will be profitable to you — and focus your energy on those. It’s essential that you stay consistent in touch with your customers. Using a CRM software to manage your leads will also help you to measure and monitor the activities at every stage of the customer’s journey and follow up your leads automatically. That means you’ll find out where you have bottlenecks and where opportunities exist for you to convert prospects to customers. A CRM ensures that your sales process are seamless and better. Besides, businesses that use marketing automation to nurture prospects experience a 451% increase in qualified leads, according to a study by The Annuitas Group. Find a CRM that works well for your business and use it — it doesn’t have to be an expensive CRM — but a CRM that does what you need to help you make your sales process seamless. In the end, your business will remain as top-of-mind to your prospects, and they will continue engaging with your business. Even for those who are not ready to buy, whenever they decide to buy—you’ll be a one-stop-shop for them. Lead prioritization is an essential practice that allows you the chance to decide which lead to respond to first. According to InsideSales, 35 – 50% of sales go to the vendor that responds first. Several studies also show that an immediate response to leads and being persistent with lead follow up results to a 341% lift in sales. The bitter truth is if you’re not tracking your leads, you’ll be wasting your hard-earned dollars chasing the wrong leads. The bottom of the sales funnel is where you have to close the leads — a crucial stage, and the worst stage to lose your customers. You should use tools that allow you to score your leads effectively of which an automated CRM is one. 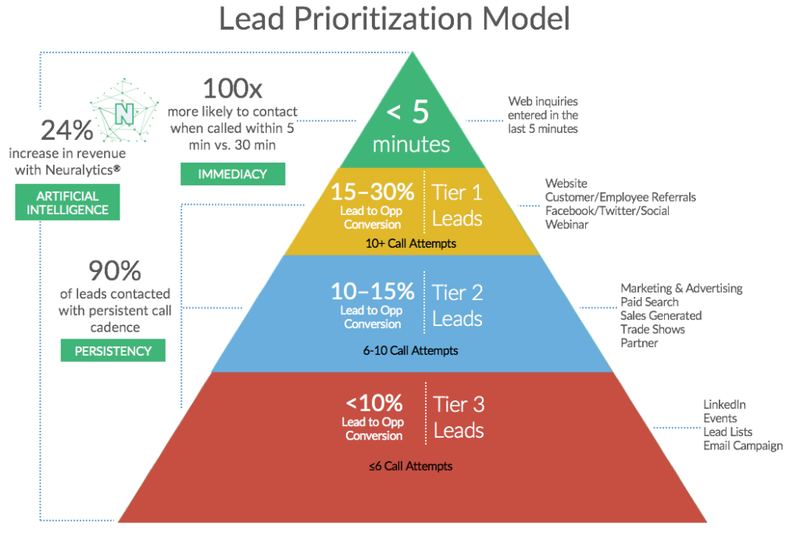 Here is a valuable diagram of a lead prioritization model from Inside Sales. You spend a lot of money to generate customers, losing them to your competitors before they become premium customers is painful. Integrating these strategies into your sale funnel will, to a large extent, help you generate more paying customers. The sales space is replete with tools, but few play well together. Here are 6 to get you from prospecting to proposal to closed-won, all within Outlook. Do you know how your sales content actually impacts your bottom-line? Here’s why every company should conduct a sales content audit – and how you can do it in just 6 simple steps.